Can ‘New’ Keynesianism Save the Chinese Economy? Why national capitalism will not be enough to keep China out of trouble. Clearly, the Chinese economy has problems, and now appears to be tumbling rather rapidly down along its so-called soft-landing path. Overcapacity began to emerge from around 2013 in the infrastructure sector as well as in numerous manufacturing industries such as shipbuilding, solar cells and wind turbines. The ability of both the public and private sectors to pay back their debt (local government loans and other debt due to massive investment in urban expansion and the foreign debt of several industries experiencing overcapacity, such as construction, real estate, cement, metal materials, and other infrastructure and real estate-related sectors) is now questionable. Most critically, an over-priced real estate sector has been sucking the economy’s wealth and purchasing power dry. On top of all this, an aging population and shrinking labor force are pushing up the cost of labor, before most industries have managed to build competitiveness through continuous productivity improvements based on sound management, high quality control, attractive design and branding, and technical innovation. In fact, recent economic policies in China appear to have overlooked “productivity” – the essence of economic growth – entirely and focused instead on encouraging the sale of more houses and apartments at steadily rising prices. In line with this spirit of economic governance, monetary policy has been extremely aggressive. Data show that from January 2008 to October 2015, China’s M2 measure of money increased 2.25 times, implying annual increases of 16 percent. During the same period, China’s economy expanded at a rate less than half that. Domestic inflation as well as expectations of inflation, although never acknowledged by the statistics bureau, has been high since 2008, when China announced its four trillion yuan stimulus plan. The state also manipulates the supply of land for housing. Combined with strong expectations of inflation, and the depreciation of the value of the yuan as the outcome of aggressive monetary policy, property prices have been rocketing higher. The Chinese government relies on property-related taxes and sales for some 40-60 percent of its financing. So it is not just individual and institutional investors who are addicted to the property bubble, but also all levels of government. Local government together with infrastructure-related industries have also accumulated tremendous debt due to the aggressive and excessive expansion of cities and towns. The fate of commercial banks, needless to say, is tied to ever-higher property prices. For all of these reasons, the value of the yuan in terms of its purchasing power no longer justifies its current exchange rates against other major currencies. However, allowing a drastic depreciation of the yuan is equivalent to deflating the domestic property bubble, as investors may rush to dump their inventory of properties and exchange their money into foreign currency. Banks, local governments, and infrastructure-related industries may simply collapse. Such is the danger of currency depreciation. 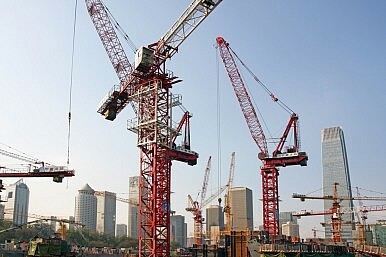 However, the Chinese economy still has some cards it can play to avoid a systematic meltdown. First, the state could impose capital controls and literarily close the offshore RMB market, reversing decades of progress in financial sector reform. Second, it could pump massive liquidity into the economy and create high inflation. Knowing that the real estate sector has been sucking up liquidity, the state could simply increase the source flow – printing more money to maintain the circulation in the economy. Higher inflation could also gradually absorb the spiraling property prices. Third, it could ease financial regulations devised to prevent risk in housing mortgages and provide further tax and interest incentives for the purchase of properties, extending even to low-income groups. Yes, these measures are tantamount to drinking poison to quench your thirst. Yet, these are the short-term policies being chosen by Chinese state government. However, the authorities do also have their eye on some long-term remedies. On the one hand, the Chinese government is calling for a nationwide effort on technological innovation and entrepreneurship for high-tech and high value-added start-up companies. On the other, the state has nominated several high-tech industries for technological catch-up, investing public money in R&D, patent acquisition, and bids for high-tech companies in developed countries. These industries include electronic chipsets, CPUs, robotics, new materials such as carbon fiber, and aviation engines. The initiative should boost productivity growth over the medium to long terms. But we need to pay attention to the business models being used in this effort. National capitalism has been shown to work in leapfrogging technologies. In China, examples can be found in defense, space, supercomputers, nuclear energy, high-speed rail, and mega-infrastructure (including deep water drilling platforms). This method of catching up is fast and effective. Basically, you simply need to have an economy of sufficient size combined with the means to harvest social wealth (such as through monopolistic state-owned enterprises or the sale of land rights in a prospering property market). Almost any technology can be acquired from the global markets if you have a trillion dollars ready to spend. However, when it comes to technologies that are developed in competitive market environments through continuous investment in R&D over a span of decades, Chinese industries typically struggle to bridge the gap. This can be attributed to an economic system that gives extraordinarily high returns to rent-seeking behaviors – for instance, monopolizing markets through administrative and even legislative means, bribing authorities to bypass labor regulations, quality regulations and environmental regulations, or pirating patents and design for free – rather than aiming for high returns on investment in R&D and continuous improvement in process, design, and quality. The automobile industry, the precision instrument industry, machine tools industry, computer chips and CPUs, and special steel manufacturing industry are examples of major failures. Only a few industries, which can maintain a competitive advantage achieved with new technologies through intrinsic economies of scale or trade secrets, rather than the strict protection of patents and design, manage to develop leading technologies in competitive markets, examples being the dotcom industry and communications equipment industry. Unfortunately, this can only happen in a few industries whose markets or technologies have the requisite characteristics. Therefore, if the Chinese government does not improve its legislative, regulatory, and tax systems, while clamping down on excessive monopolistic power, distorted incentives for investment in moving up along the global value chain will remain. As a result, state-driven catching up will not create internationally competitive high-tech industries. In a broader sense, if the Chinese economy cannot improve its micro-level efficiency, Chinese industries are unlikely to be more innovative than they are now to prepare for future competition further up the global value chain. This issue will be even starker as the Pacific rim enters the TPP era. In recent decades, the Chinese economy’s strength has been rooted in the business model of mass producing products and services using technologies that have matured and require only low to midlevel skills in labor, design, management, and marketing. These mass-produced high-tech products and services have quickly flooded domestic and global markets, benefiting the majority of people, as they are usually very cheap. In that sense, China has not only achieved economic growth, but contributed to global poverty relief. Historically, national capitalism has played a solid complementary role to this unique Chinese economy advantage, again because of the sheer size of the economy. High-speed rail, third-generation nuclear power technology, the TD-SCDMA version of 4G telecommunications technology, and ultra-high-voltage (UHV) power transmission technology are perhaps the best examples of this business model. To conclude, national capitalism, which aims to help the Chinese economy move up the global value chain through technological catching up, can be considered part of the essence of the “new” Keynesianism – in other words, the Chinese approach to intervention in the current economic downturn. It will certainly continue to make significant progress in certain well-targeted areas, given enough time. However, there are two key dimensions to measuring how successful the strategy will be. One is the timeline: how long it takes for such efforts to be translated into significant productivity gains for the whole economy. Second, whether or not these selected areas, especially AI and robotics, can bring about a major productivity boost as seen with the IT boom in the 1990s and early 2000s. In addition, national capitalism, a centralized strategy, is an intrinsically high-risk approach to technological development. Even with well-informed decisions, such as the case of Japan in developing HDTV, there are always surprises. The Chinese government can only hope that it has chosen the right technologies to pursue. Finally, it is worth mentioning that the other part of China’s “New” Keynsianism, namely the One Belt One Road initiative, which is about exporting the products and services of over-capacity, infrastructure-related industries overseas, also seems riskier than usual. Put another way, if these proposed infrastructure projects in targeted developing countries were attractive and low risk, they would have been financed and done. The fact that they are not itself implies higher risks are involved. At this point, policymakers must look inward: They must identify and implement all necessary reforms to improve the micro-level efficiency of the Chinese economy. And this always implies the importance of truly open, competitive, transparent and fair markets for all industries. That is a vastly superior approach to the Ponzi game of emphasizing ways to manipulate the property market to keep prices climbing ever higher. Dr Yanfei Li is an Energy Economist of the Economic Research Institute for ASEAN and East Asia (ERIA). He specializes in energy markets, energy policy, and economics of technological change, serving the interests of both academic and public sectors. China has played its own economic game. Time to throw out the economic textbooks?